Lauren first joined Fury in February of 2017, and despite the fact that it is her first experience with CrossFit she absolutely loves it. 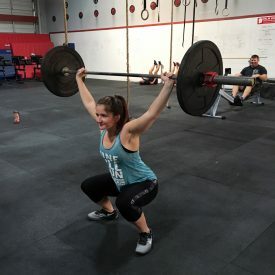 Lauren has already been active in power lifting, but really enjoys the fact that CrossFit always pushes her to improve her fitness, as well as the community that she has gained through Fury. She is currently a student at Grand Canyon University, and received her L1 coaching certification back in June. Lauren enjoys traveling and has spent a lot of time volunteering overseas working with non-profits. Overall, Lauren loves to connect with people and is excited by the opportunities and friendships that Fury offers. In her free time Lauren really enjoys hiking, camping, swimming, and adventuring in general.